Twilight, or Twi to her friends, was Sunshine's second foal. Twilight was born in Florida for Sunshine's owner Dr. Sandy Price. Twilight is sired by the Thoroughbred stallion Big Bluffer, a son of the great Bold Ruler. Twilight was trained in cutting and jumping before finding her true talent in the dressage arena. She was trained in dressage by Kathy Daily. In 1992, Marguerite Henry wrote a book about Twilight's life. The events in Misty's Twilight are for the most part true, with some fictionalization. Twilight is the dam of four known foals. Her first was Misty's Twister foaled in 1984 and sired by a Quarter Horse. Twister was to appear in her dam's book, but her part was cut out before publication. Twi's second foal was Misty's Mirage a filly foaled in 1985. 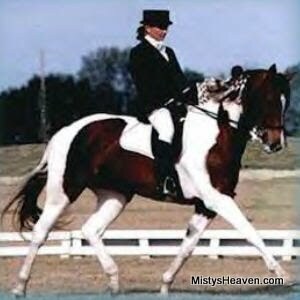 Marguerite's Misty Morning was born in 1994 and is sired by the famous Dutch Warmblood stallion Art Deco. Marguerite was foal on Marguerite Henry's birthday, hence her name. Twilight's last foal is Misty's Moon Shadow a 1999 flashy pinto mare sired by a Paint. After Moon Shadow was born Dr. Price didn't want to risk Twi having another foal. Twilight retiring from riding a few years after Moon Shadow was born. Twi made it clear that she was no longer interested in such things when Dr. Price rode her one day. Twilight lived a a good long life in retirement until she passed away in 2009 at the ripe old age of 31.